Rainbow Rowell’s short story, Kindred Spirits, is one of the most laugh-out-loud, hilarious books of the year. Rowell tells the story of a teenage Star Wars fanatic who stands in line four days early for a seat at the new Star Wars movie, The Force Awakens. Kindred Spirits, though, is much more about the relationships that form during those four days than it is about Star Wars. Elena is 18 and obsessed with Star Wars, mostly because of her dad’s obsession with Star Wars. And now, it’s 2014 and The Force Awakens is about to be released. Elena has heard of the lines that formed for Star Wars movies in the 1980s and even the 2000’s when the prequels were released, and she is ecstatic to be able to join in the comradery of this tradition. So, she has her mom drop her off at the theater four days early. And, there are two people in line…for the entire four days. Throughout their four days together, Elena, Gabe, and Troy form something like a friendship. Elena, though, discovers more about herself and the unpredictability of life. Things might not always turn out like she imagines they will, but they often turn out in a way that still brings joy and unexpected life changes. Released by St. Martin’s Press in 2016, a special release hardcover edition of Kindred Spirits was released for this year’s Independent Bookstore Day. There’s a tendency to leave The Best of Adam Sharp simply there: amazing. Graeme Simsion’s forthcoming novel is more than amazing though. It is beautiful, heart wrenching, nostalgic, and absolutely enthralling. The Best of Adam Sharp is a story of unrequited love that seems to always be moving in the expected direction until it’s suddenly not. Adam and Angelina found each other in their mid-twenties in Australia and lived out a love affair that only lasted the few months that Adam worked a temp job there. Things never really ended for Adam though, who has thought of Angelina ever since, despite his now twenty year relationship with Claire. Twenty-three years after his relationship with Angelina has ended though, an email message pops up out of the blue from his lost love, and Adam isn’t sure how to respond. With characters so relatable and problems so palpable, it’s hard not to get drawn into The Best of Adam Sharp immediately. Simsion has a way of making the story more about the human condition than anything else. While not everyone has a lover they wish things would have gone differently with, everybody has regrets, and Simsion doesn’t let readers forget it. To add to the allure of an already brimming novel, Simsion includes a musical component to The Best of Adam Sharp that adds an extra element of nostalgia. Not only is most of the music from the 1960’s through the 1980’s, but if readers are familiar with the songs that pervade the novel, The Best of Adam Sharp’s soundtrack becomes something that moves the book in an even more emotional direction. Each song that comes up not only fits its scene too perfectly, but if you play it in your mind’s background, the musicality, the movement of the music, fits the mood even more perfectly. Simsion evokes so much in The Best of Adam Sharp that it’s a challenge to leave the book at the end. You’ll just want more. Slated for release in May of 2017 by St. Martin’s Press, The Best of Adam Sharp by Graeme Simsion is available for preorder at your local bookstore. 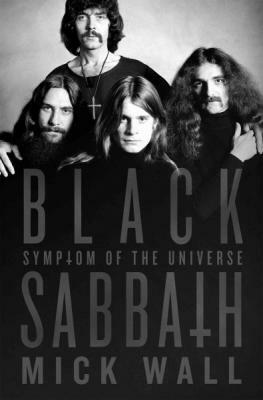 Black Sabbath: Symptom of the Universe (St. Martin’s Press) by Mick Wall is a fully comprehensive biography of not only the legendary self-same titled metal band but of each of the core band members of the group. The 320 page book spans the entire career of the band and its diverging members up through their reunion tour in 2013. Perhaps the most interesting time periods portrayed, though, cover the lesser known years of the band’s youth before they were Black Sabbath. To learn that guitarist Tony Iommi bullied Ozzy Osbourne in primary school or that when Ozzy first joined the band he had a shaved head were interesting, odd facts that made the narrative more fully engaging, especially for a Sabbath fan who might know a good deal about the band to begin with. Though fans might be aware of the fact that Iommi lost the tips of two fingers in a factory accident, they are less likely to know that he made substitute fingers out of a melted down bottle so that he could continue to play guitar. At first the reader is drawn into the emotional pull of the band’s inception and the excitement of their finally being recognized for their obscure and novel style of music. However, since the book covers such a large expanse of time, reading about the continual rise and fall of the band can become a bit burdensome and repetitive. This though, a fact of the band’s existence, was something that couldn’t be avoided by Wall. Wall, a writer, editor, and press agent, writes Black Sabbath: Symptom of the Universe almost as if it were a novel. His descriptive language and storytelling style, though, does err to the side of grandiose and can be rather overbearing. There is a sense of hyperbolic animation that at times detracts from the pure sentiment that could have been conveyed in merely telling the story rather than interposing adjectival descriptions in a scene where the emotion and verve are obvious to the reader. Wall does his best to tell the band’s history from as many viewpoints as possible, lending a level of intrigue to the text in the dissimilarities portrayed. Though he clearly shows bias in terms of which perspective he favors, he still strives to include multiple viewpoints that the reader is able to interpret on her own. The story of Black Sabbath, of Ozzy Osbourne, of Ronnie James Dio, and of the numerous other band members who played a part in the history of both Black Sabbath’s success and demise is told in a complete and linear manner that leaves little left to be imagined. Slated to be released by St. Martin’s Press April 14, 2015, you can preorder Black Sabbath: Symptom of the Universe by Mick Wall at your local bookstore. FTC Disclaimer: This book was given to me by the publisher in return for a fair and honest review of the text.